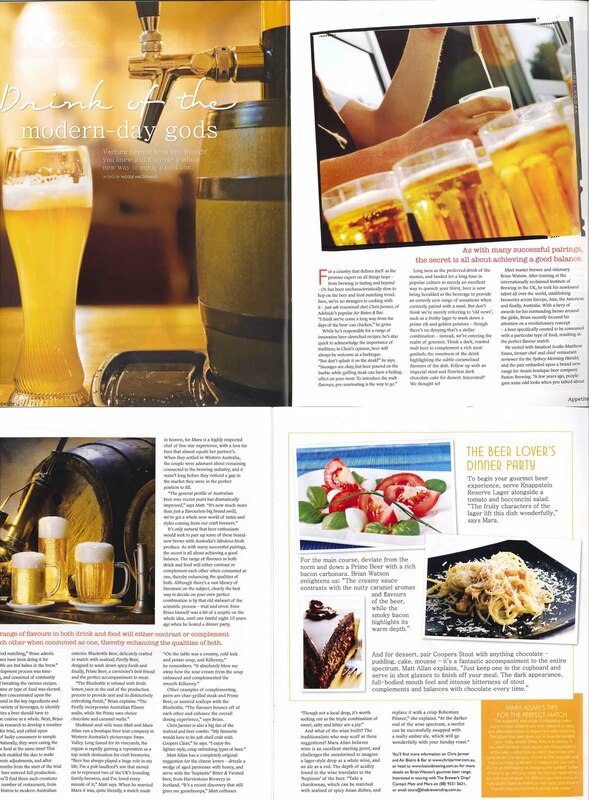 Here's the beer & food article published in Australian Appetite magazine a couple of months back. Few quotes in there from The Brewers Dray! Its a scanned jpeg, so hopefully you can read it without too many drama's. In keeping with the traditional Munich timing of the event, The Monk kick off their Oktoberfest festivities with an Opening Party on Saturday 18th September. The German beer will be flowing, the German food will be in excess and your favourite Monk brews will be on tap! Festivities will continue until the 3rd of October, with traditional food specials including Monk made pretzel, purchase your own limited edition commemorative steins, enjoy traditional German bottled beer and The Monk’s own Oktoberfest lager, and for your sonic pleasure on the 18th The Alpen Duo will be entertaining from 1pm – What’s not to love! E-mail functions@themonk.com.au or speak to staff at the venue for further info. On Saturday 2nd October, Salt on the Beach host their Oktoberfest party. Come dressed in your best German outfit and party on at the beach. Prize for best German dancer and best German outfit! $15 Tickets on sale now! Includes entry, festivities and bratwurst bun. 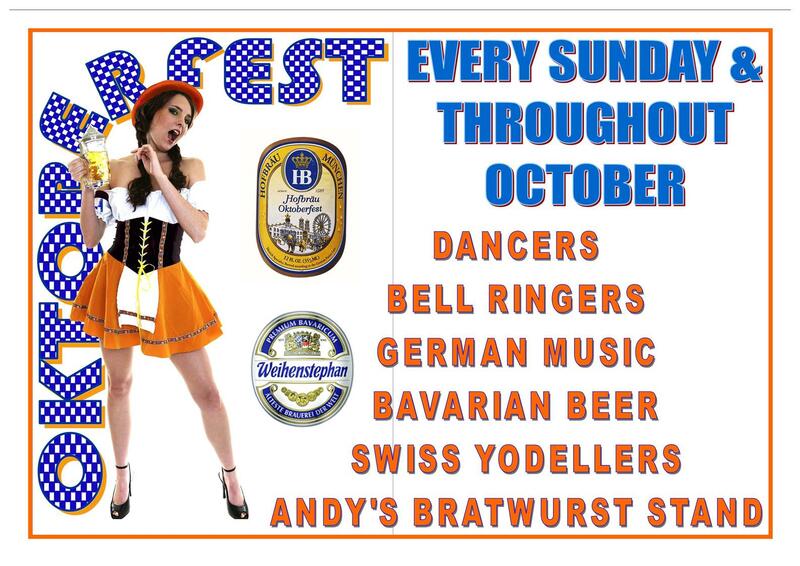 Polka dots playing live from 2-5pm : German Dancers from 5-5:30pm : DJ from 6-10pm : German games all day! Party mit uns in Salz, deutschen Stil! 9430 6866 for tix. Mash Brewings First and Biggest Event of The Month for the Spring In The Valley Festival 2010. Join them and celebrate SITV Mash Style, Outdoors at the Brewery. Craft Beers & Food and Great Music all weekend. Live Music by The DTs and DJs Cinnamon & Hustler. Doors Open 10am. Get there early to avoid queues! BBQ Food/Craft Beer/Kid's bouncy castle. Celebrate the worlds biggest festival Oktoberfest at Mash Brewing in their themed Beer Garden with German Food, Special Release Beers and DJs Cinnamon, Hustler & Moosh. Entry includes a souvenir Stein to take home. It's business as usual at the Valley's most awarded brewery throughout October, with the venue in full party mode on the 9th & 10th for annual Spring in the Valley celebrations. Entry to the party zone will set you back $10, with no pre-booking available, so it's first come first served. Get there early to avoid disappointment! For more info give the guys a shout on 9296 4657. Ironbark are celebrating the month long Spring in the Valley event with live music all afternoon across the weekends. Entry is free but bookings are highly recommended as they are already starting to fill up on available spots. Call 9377 4400 for bookings. It's all systems go at Elmars over the whole month of October, here's just a sample of whats going on, check out their website http://www.elmars.com.au/ for all the info. Every Thursday during October (7th, 14th, 21st, 28th) Enjoy a delicious two course lunch for only $17.50 per person, or three courses for $21.50 per person. Bookings Essential. Friday 1st, 15th, 22nd, 29th October (not available during 2nd week, Fri 8th Oct) Enjoy three beer tastings and a smallgoods snack basket (to share) for just $5 per person. Available all day Friday, a minimum group size of 4 people applies. Sun 3rd, & Sun 17th & Sun 31st The BBQ will be sizzling in the Beer Garden from 3pm with a range of mouth watering Elmar’s products, perfect for an afternoon snack! Relax & and enjoy a delicious Bratwurst with live music by Ben Merito. Sunday 17th October Stop by Elmar’s and browse through an amazing range of local art & craft displays on show in the Beer Garden from 11am - 4pm. The BBQ will be sizzling from 3pm, however lunch reservations are essential. Saturday 23rd & Sunday 24th October Experience Oktoberfest right here in the Swan Valley. Open from 11am - 5pm with live music all weekend, entry is FREE, just purchase your glass, or bring one along from last year. 3.30pm-6.30pm Darren Reid & the Soul City Groove! 4pm-7pm The Rusty Pinto 'Rockabilly' Combo! Oct 16 & 17 and Oct 23 & 24 (as part of Spring in the Valley). The Duckstein Brewery lies in the heart of the Swan Valley on West Swan Rd. and is a fantastic venue if you are looking for a more authentic German Oktoberfest. Featuring German-style craft beers; Pilsner, Hefeweiss and Festbier. There will also be a range of wines and champagnes to help celebrate this fun day out. Bratwurst & Pretzels are available for hungry revellers. Live music can be heard throughout the day with traditional music from the 6-piece Dolomiten Polka Band and party music from Alan Stewart’s Band. There will also be traditional dancing and Shuhplattler from the Rhein Donau Club’s Eidelweiss Dancegroup and a cowbell-ringing performance by Echo der Berge. Plus a range of Oktoberfest games and competitions with prizes to be won. Tix are $12+ bf (2% credit charges apply online) available from Heatseeker.com . There are currently no specific Oktoberfest events listed for other notable local brewpubs/venues Little Creatures, The Old Brewery, The Generous Squire or The Last Drop. If i've missed off any events, please either add them to this blog post as a comment or post them on our Facebook page http://www.facebook.com/pages/The-Brewers-Dray-Boutique-Beer-Explorer/6389058201 .